Its Day Nine of OSR Christmas. Before we get to today's festivities, let's find out who is the recipient of yesterday's awesome gift. Jan Egil Bjune - congrats. Email me at tenkarsDOTtavern and we'll get you hooked up. Now for today's gift. We are giving away X2 - Castle Amber is Print on Demand and PDF. Quite possibly the most popular of all the "X" modules. This module contains referee notes, background information, maps, and exploration keys intended for use with the D&D Expert rules. Oui! Oui! I love this module. Ooo... I'm all about old TSR modules. I've read this, but never owned it, hopefully I'll get to change that soon. Played through it a bit many years ago. Awesome map. I re-used that with minor tweaks so many times. Played my first paladin in this one. Wow, great memories! 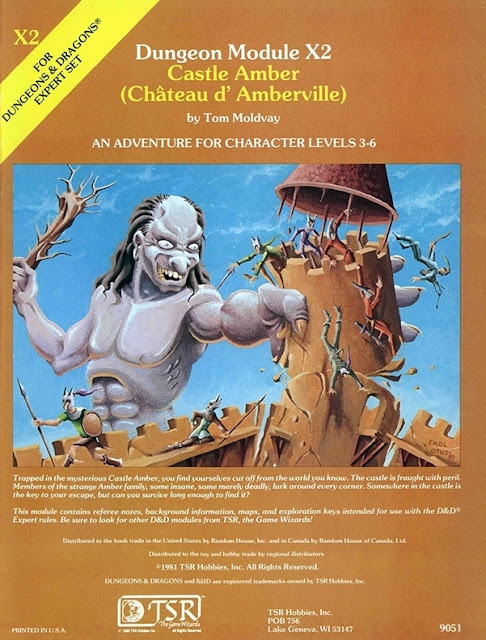 This was one of the first AD&D modules I ever played. Some good memories here. Were I meant B/X. Ooops, two hours of sleep, haha. Excellent module. Really enjoyed playing through it. Really nice introduction to some of Clark Ashton Smith's work. Love that this is for levels 3-6 and showing big nasty on the cover. Amberawesome! I love this module. Looked it over in the hobby shop many times in the early 80s but never purchased. Although I am a late comer to D&D in many ways, I actually played this module at Origins one year. One of my all time faves! Would love this! I've read good things about this module. It sounds like it'd be a blast to way with the right group. I try, try again. Thank you and Merry Christmas! Oh, this takes me back. Cool. Definitely one of my favs from back in the day & how I was introduced to Clark Ashton Smith. I have fond memories of playing this back in the day! And hope you have a good Christmas and New Years! day late on the last one I commented on. Here is my entry into today's give away. Good luck everyone. This is one I've had in print since the 80's. The PDF would be nice, though. I great one that I would love to own. A classic! Count me in. I am in for free loot! This would be a ton of fun to run! Count me in! Merry Christmas! One of the first D&D modules I played and also one of my prefered ones. I've had it once, but I lent it to somebody and it never returned... so count me in, of course! Would love a new copy! Loved this one when I was a kid, then had forgotten about it for a while. Need to read it again! Great adventure! Thanks for the offer! Been reading the CAS collections; got me interested in this one for sure! This module has so many memories for me. Would love to have a copy. This is perfect since I just ordered volumes 4 & 5 of Clark Ashton Smith's stories . . . . Thanks for the opportunity. Merry Christmas! I'll be a winner one day! The Prize'll come out tomorrow?